With Residential Air Conditioning cooling and heating, you provide a perfect climate, every day of the year. Commercial Air Conditioning Installation of multi room systems allow multiple indoor units to operate from one outdoor unit. Humidity and temperature climate control are key features of our Bespoke Wine Cellar Cooling installations. Here at ECS we offer complete Air Conditioning Installation with Londons best Air Conditioning, alongside custom ventilation design across London and the surrounding county. We offer a competitive quote matching and price beating service on all quotes provided by competitors. Additionally, we also offer a free Air Conditioning Service on all new Residential Air Conditioning installations. 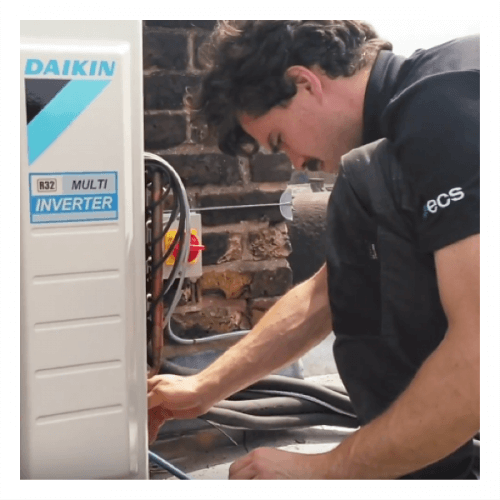 We are also happy to announce that as of OCT 2018, ECS has now proudly become a Daikin Air Conditioning accredited D1 partner. What does this mean for our New customers? We can now offer up to 7 years warranty* on your Air Conditioning Installation subject to a yearly servicing contract also as a Daikin D1 partner we have manufacturer priority access, to technical assistance and parts in the event of a fault with your system. This means Air Conditioning Repairs are completed quicker and essentially, we get your climate control back up and running faster, therefore, offering minimum disturbance during the peak summer and winter seasons to your family. Daikin has for many years been the industry leading manufacturer. Focusing solely on the manufacturing, production and advancement of Air Conditioning technology. With the correct maintenance, 99.9% of Daikin AC units will never suffer a major system failure. Additionally, our new Daikin 7-year warranty will give you further peace of mind and assurance. Daikin systems offer the highest energy efficiency and lowest noise ratings in the industry. Air Conditioning Installation in London was once seen as part of the luxury home design which was only used in the summer months, however this has changed due to the ever growing, over crowded home build sector. Where build companies are producing heavily insulated but poorly ventilated homes. As a result this has created an increase in the demand for Residential Air Conditioning in city areas. This is mainly due to many new build homes having high spring and summer temperatures due to the heavy building insulation. Planning permission boards will on occasion deny Air Conditioning Installation of the outdoor condenser part of the system which does sometimes cause delays, however with our help in managing this process, we often get landlords and tenants their council approval within weeks. ECS is a London-based Climate Control and Air Conditioning Installer of carbon footprint reducing Air Conditioning, Ventilation and Heating systems. ECS is also an installer for manufacturers such as Mitsubishi and Hitachi. These are the leading industry giants when it comes to Air Conditioning Manufacturers. In turn, the focus has been placed on low noise quality Residential Air Conditioning. Furthermore, their research into Commercial Air Conditioning applications has developed renewable air source heat pump technology, which is second to none. At ECS we train our engineers through all areas of Air Conditioning Installation and we work between the smaller Residential Air Conditioning installation sector to large Commercial Air Conditioning installation in the public sector. Our engineers have over 40 years of experience in the Air Conditioning Installation field, in central London and its surrounding towns. As a result, we can also design and install Custom Air Conditioning Systems to fit small spaces. A project manager will be able to give a solution, even where it may not normally be possible to fit an outdoor condensing unit. In some cases at an additional cost, we install acoustic noise-reducing housing, to deliver zero noise dB in the space. Small Air Conditioning Install space? Not a problem, we also supply small single fan outdoor Air Conditioning Systems. These systems will be capable of cooling and heating your entire home. As with all Air Conditioning Installation projects, different methods of install and design will be needed. When it comes to small space custom Air Conditioning… this is what we do BEST. Is your commercial building suffering from cold draft spots? Do you have an old heated and chilled water circulating system? Old mechanical water systems installed during the original construction of your building require more than just a basic AC service. The water circuits need treating for bacteria and scaling. Strainers need regular cleaning and water flow rates need balancing throughout the system. Our commercial mechanical engineers with water flow metering tools are waiting for your call! At ECS all of our engineers have undergone intensive training in the latest water flow balancing techniques and digital tools. 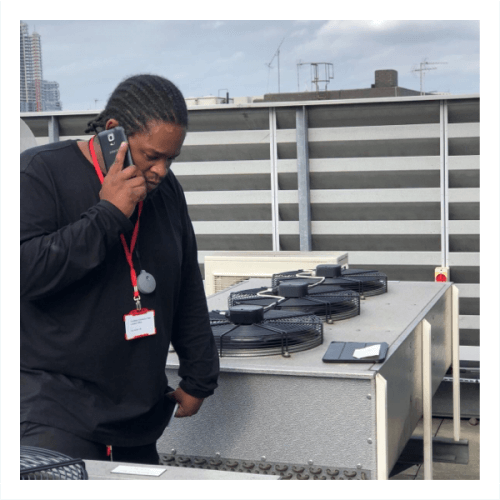 Watch as our engineers below perform a Trane major chiller maintenance in London, also why not follow our video library in youtube to see more of our new exciting commercial services we are specialising in for 2019! Always call an experienced Air Conditioning Service Contractor for your major AC servicing obligations. FGAS regulations stipulate a mandatory six month gas leak test on your system. However, between your schedule service visit dates, with frequently used Air Conditioning Systems it’s important to keep your filters clean. Regular filter cleaning will stop the spread of dirt and bacteria, also it will also increase the energy efficiency and lifespan of your system by up to 50%. Ready to reduce your energy bills and keep your environment smelling fresh and clean? Grab some disinfectant spray, washing up liquid, a hand pump sprayer then follow our video guide below. Watch our easy to follow step by step DIY guide on how to service your Residential Air Conditioning System in a few easy steps. Click here to watch now! Firstly did you know that 9/10 Air Conditioning Installations in homes with closed walls and are completely decorated, are retrofit! This is why all our Air Conditioning Contractors are equipped with the latest high-end tools and equipment. This helps to ensure we complete the job faster, smoother and with minimal disturbance to your home. 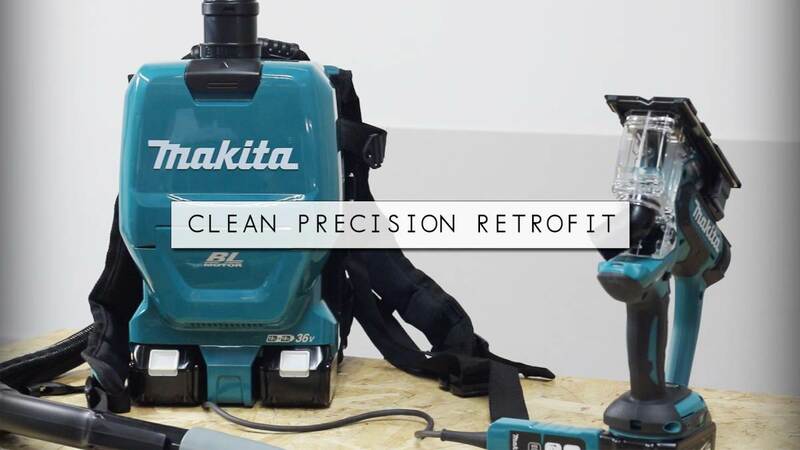 The latest and greatest tools we use are by premium tool brand Makita , because they are the core innovators in the world of cordless power tools. With the Makita cordless backpack vacuum and the cordless drywall cutter combination, we are able to clean up dust and debris whilst we cut into the walls to get inside. Ensuring the debris doesn’t get everywhere – on the floor, in the air or behind the walls. This means minimal clean up time and maximum efficiency. Sometimes a lot of the dust and debris is unseen especially if it’s behind the walls which can cause irritation, allergies and respiratory problems, however we eliminate all of that. Less mess is always best. Our huge range of premium-grade tools are the best in the industry. They do the tasks at hand to extreme professional quality. 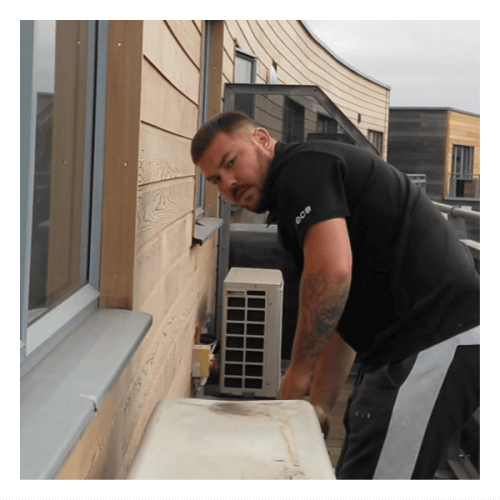 ECS also provide tutorials on how to use these tools therefore, if you’re interested in learning how we use them in an Air Conditioning Installation why not head over to our HVAC Videos Page for more information. Top of the range toolsets and heavily qualified professionals! With decades of experience, above all, we provide unparalleled services for the customer. 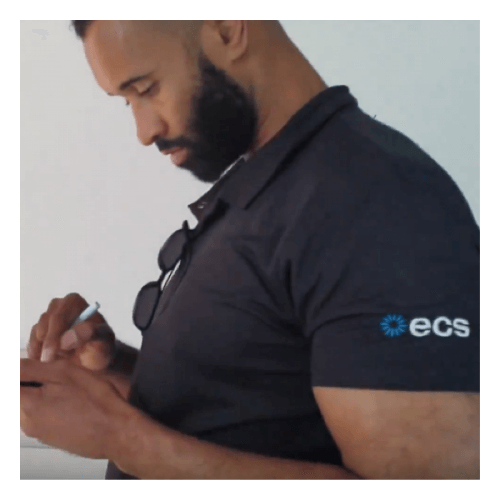 As part of our unique complete transparency and trust at ECS between us and our clients, we are releasing a unique series of videosoffering you the chance to meet some of the team’s key players during your London HVAC installation. We’re a close tight-knit group of people, who work to please our clients to the best degree possible. Showing you the team allows us to show off our talent, whilst you can see exactly who will be working on your projects.